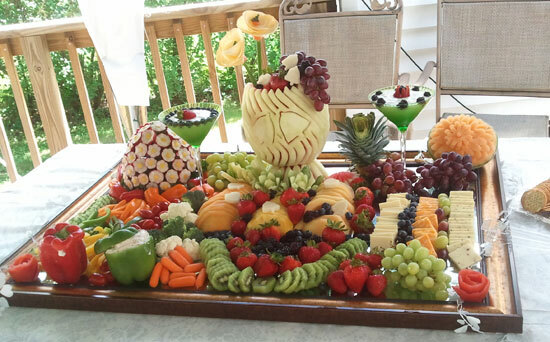 One of my student /customers Sharron Nickerson recently created a wedding fruit display for a wedding that she hosted at her home. It was her first large fruit carving display. Here is what Sharon wrote to me when she sent her photo to me. My fruit and veggie appetizers display turned out awesome. No one could believe it was my first one. I have done smaller fruit bouquets but nothing on this scale. 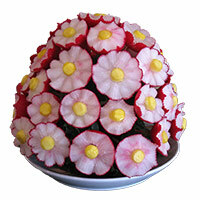 I found some other Ideas from off the Internet but the watermelon and Radish bouquets were the favorite. It was a big hit at the wedding in my back yard. I did get the tools on Friday. I agree with Sharron, it did turn out awesome. Take a look at her photos. I love to see how people take ideas that I present in my blog and lessons and adapt them in different ways. Here, Sharron took the watermelon bowl idea that I showed for the 4th of July and made it her own by carving wedding bells into the sides of the bowl. She then artfully arranged some grapes cascading from the top and added wedding bell cut with cookie cutters as decorations. Sharron also took advantage of the free lesson that I offer for making a radish flower bouquet and used it as part of her wedding fruit display. Radish Bouquet from Free Lesson added the this Wedding Fruit Display. 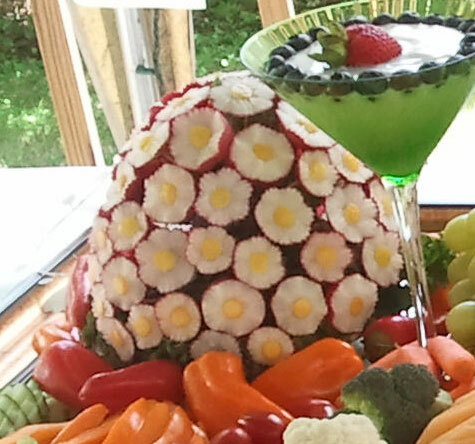 Sharron displayed her fruits and veggies artfully on a large framed mirror. If you look in the front corners of her display you can see that she added some tomato roses. I show you how to make those in a free tomato roses video lesson on my blog. Can you believe that this is Sharron’s first large fruit display with carvings. Beautiful, isn’t it? 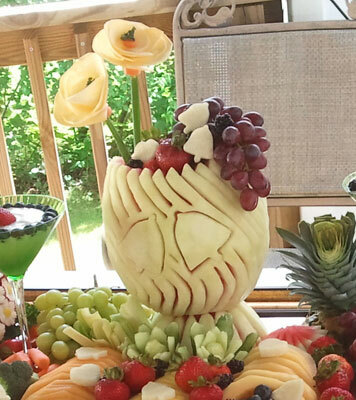 If you are planning a wedding or event, and wanting to make a pretty wedding fruit display, I hope that first time carver Sharron Nickerson’s wedding fruit display gives you some ideas and inspiration of you own. This is just amazing. And so inspiring. You can be a proud teacher Nita. This is a beautiful display. I am doing a wedding for a friend in Sept and have been searching for ideas. I just completed the 1st two free lessons and was amazed how easy it was. Your display is beautiful and different. I love it. What is the two green drinks? I’m glad you enjoyed my 2 free lessons. The photo with the green drinks is a display that was done by Sharron Nickerson who made the radish bouquet after learning how from my free lesson. So, I can’t tell you what those “green drinks” are. Based on the ring of blueberries in the top of the martini glass, it looks to me like they are some sort of gelatinous thing. Maybe an aspic, dip or jello? I love your web page! It is simply amazing how vege’s & fruit can be transformed into pieces of art. Thanks for creating this page I look forward to more carving techniques. I’m glad you enjoyed seeing this post. Happy Carving! Tell me please what is the name of the knife to cut strips on watermelon. 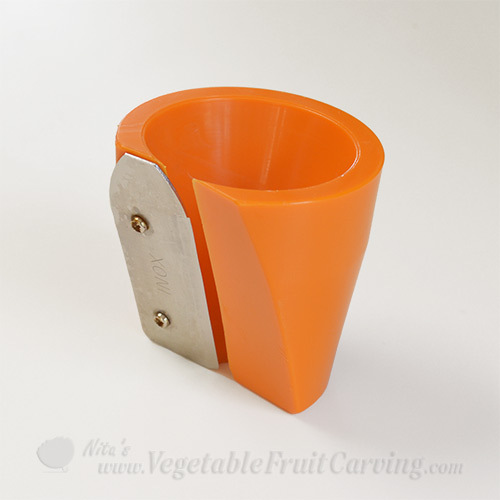 If you are referring to the way Sharon has carved here melon with the bells in this post, you can use a fruit carving knife like the small knife in my Kom Kom 3 knife set or a Thai Pro Knife. You can also use any pointed paring knife. 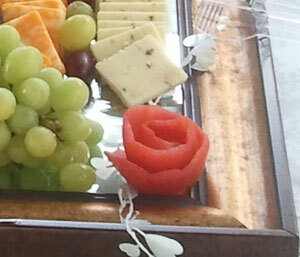 It’s easier to manuever curves and to remove narrow strips of melon using the fruit carving and Thai style knives. 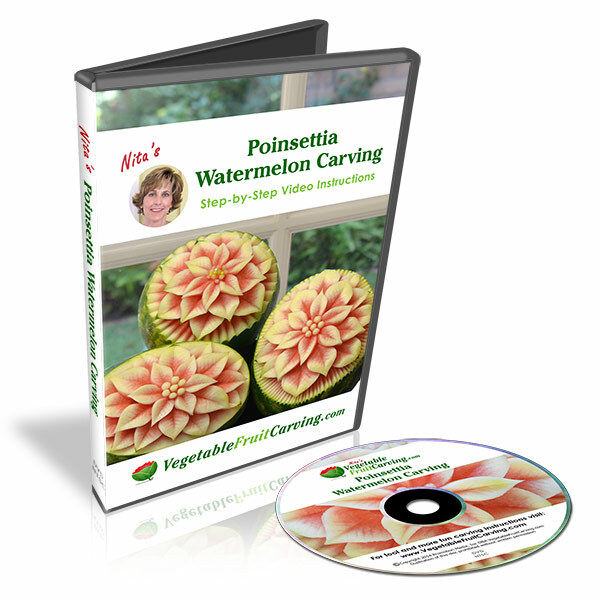 If you are asking how to carve lines in the rind of watermelons to leave a strip of the lighter colored rind showing, you can use any of the above mentioned knives or a V cutter like the ones in my Smooth U-V tool set. You will find the tools I am recommending in my online shop. I love it….is amazing what you can do with the right lessons. Thank you Nita. You are amazing. Hi Nita, I love what I have seen. You have done such a beautiful job doing veggies fruit craving. . I’m very much interesting to learn more about fruit craving. I’m so eager to learn so much more..Thank you! Here is a chart to show which tools go with which Courses. Click here to see it. I’ve also sent you an email with more details. Thank you for your interest.